To have your Wood Fence Installed on-site Contact Us Here! 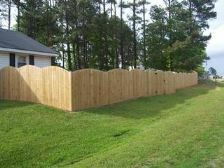 Wood Fence or better known as Privacy Fence are an easy way for a homeowner to enhance there property appearance with fence and protect there family and pets at the same time. Fence Masters Unlimited is Family Owned and Operated and has been installing fences for homeowners across the Carolina's for 12+ years. We know exactly how to build a superior product that will last years to come at a price cheaper than our competitors! 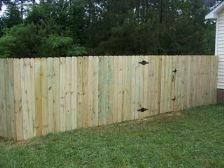 We install Wood Fence all over the Carolinas for Homeowners looking quality Fence Contractors at a reasonable price locally! All of our Wood Fence are built onsite with only the highest grade products using 5/8" Pickets using #2 2x4x8 Stringers and Galvanized Nails! All our wood fencing is custom built in 8 foot sections with ring shank galvanized nails and all posts are set in concrete 2 feet deep to provide sturdiness! Many of our competitors including Lowe's / Home Depot use a Rough Grade Lumber and Rough 2x2 Stringers attaching them with staples or non ring shank nails. This gives us a much better product value at a cheaper or equal price than our competitors charge for a quality wood fence! Wooden fences are an attractive addition to a home. However , the peace of mind that a quality wood fence can offer families with children or people with pets is the real value of residential fencing. Stockade fence, for example , comes in a variety of heights, ranging typically from 4 to 6 feet, though custom wood fence orders for higher or lower heights are common. In addition to offering near perfect visual privacy, a stockade fence of the correct height with not allow dogs to escape by jumping over and there will be no worries about young children climbing over your wood fence for a bit of un-chaperoned exploration. Free Quotes on Wood Fence usually same day or next day. Installation of Fence is provided in Charlotte NC, Pineville NC, Gastonia NC, Huntersville NC Fort Mill SC, Rock Hill SC, York SC, Chester SC, Spartanburg SC, Blythewood SC, Columbia SC and Lexington SC by our own local crews that are familiar with your area and regulations! Don't Miss Out On These Summer Special Prices! Feel free to contact us by phone with any questions or special orders at one of our local offices below! 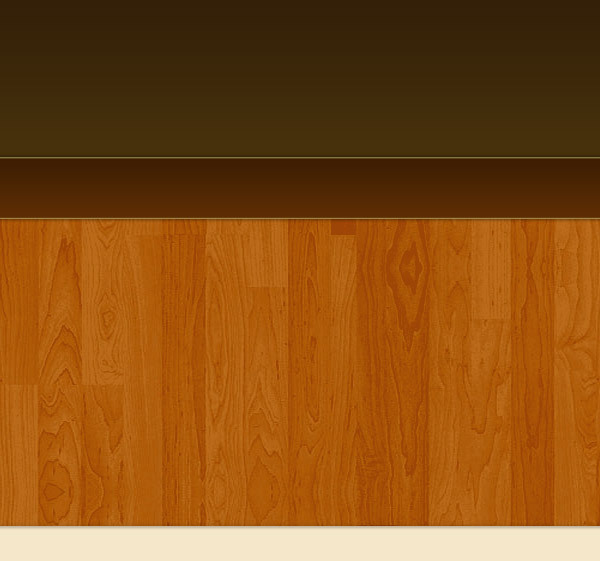 Place your order today to lock in today's lumber prices.